If you are a subscriber: Simply log in for unlimited access. If you are a nonsubscriber: You have used your free views allowed every 30 days. You must really value what we do for you. Try a digital subscription for only $0.99. Subscribe now. Partly cloudy and windy. High 84F. Winds S at 20 to 30 mph. Higher wind gusts possible..
Mostly clear. Low 63F. Winds S at 15 to 25 mph. Dr. Samantha Arleatha-Burns Knox graduated from Marymount University in Arlington, VA on May 19, 2018 and defended her dissertation in October of 2018. Samantha is the daughter of Tyrone and Sandra Burns Knox of Tulsa, OK. She is the granddaughter of Maxine M. Burns, and the late Joe R. Burns of Tulsa, and Delores Knox of Akron, OH. Samantha is the mother of two daughters, Reagan and Zoe. Samantha is a Licensed Clinical Professional Counselor (Maryland), a Licensed Professional Counselor (DC) and received the Doctoral Student Leadership Award from the European Branch of the American Counseling Association Conference in 2017. Dr. Knox currently serves as the Interim Director of Clinical Training at Trinity Washington University in Washington, DC. She also teaches undergraduate Abnormal Psychology at Marymount University and graduate courses at Trinity as an adjunct professor. 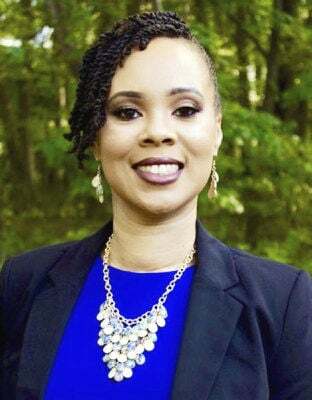 In addition to working in community mental health, and building her private practice, Aya Behavioral Health LLC, Dr. Knox plans to establish a program that works specifically with returning citizens in Oklahoma.